Once upon a time a man, a fowler, made his living by catching quails. Every day, the fowler spread grain on the ground. Quails flew from nearby bushes to eat the grain. When the ground was filled with quail, the fowler threw a net over them to catch them all. He sold the quails he caught in the market for people to eat. One very smart quail called his friends together. We must stop letting the fowler catch us. Many of our friends and family members have already been caught. This must not happen again. The next time the fowler throws a net over you. Put your heads through the holes in the net. Then everyone fly away to the nearest thorn bush. Leave the net on the thorn bush and free yourselves. The quails agreed that the plan was a good one. They all agreed that working together was a good idea. The next day, the fowler threw grain onto the ground again. The quails flew down to eat the grain. The Fowler threw his net over the birds. The birds put their heads through the holes in the net and began to fly. The fowler stood with his mouth open in amazement as the quails worked together. They lifted the net. They dropped the net on the thorn bushes and escaped to freedom,. It took the fowler all evening to get his net off the thorns. Then he went home with nothing to sell. This happened day after day. The quails ate free grain that was spread on the ground by the fowler. When they were caught in the net, they all flew together and escaped to freedom. "The quails are working together," he thought. "If I can get them to fight among themselves, I will be able to catch them." The fowler tried something new. He put his grain into a smaller pile on the ground. The quail landed to eat the grain as they always did. But, one quail pushed another to get at the grain. "You stepped on me," said second quail. "I did, but I didn't mean to," said the first quail. "Please do not be angry." But the second quail was very angry. He said very mean things to the first quail. The quails began to take sides and argue with each other. The fowler waited until the quails were fighting with each other. Then he threw the net over them. 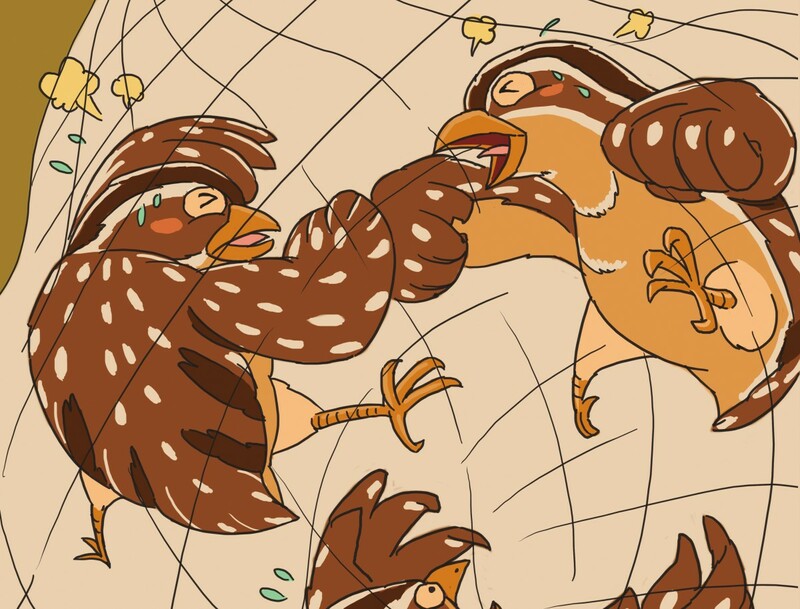 "Put your heads through the net," said one quail. "Let's fly." His friends all said the same thing. "You go first," said another quail. "Why should we do all the lifting. You start flying first to lift the heavy part of the net. Then we will join you." One half the quails could not lift the net without the help of the other quails. This was what the fowler wanted. He gathered his net and caught them all. He took the quails into town and sold them all.